Tomorrow, a few more of the new JP333-RATH two-rotor bass trombones arrive at blokeplace. This time, I'll take pictures 'n' stuff...but (sorry) no mesmerizing/fascinating "unpacking" video. This instrument: yet another JP no-nonsense truly professional quality instrument out of China, YET priced at something a serious doubler (who needs something that isn't clicky-sticky, and that resonates as it should) can afford. These will be the first of only the second dozen of these on the planet. 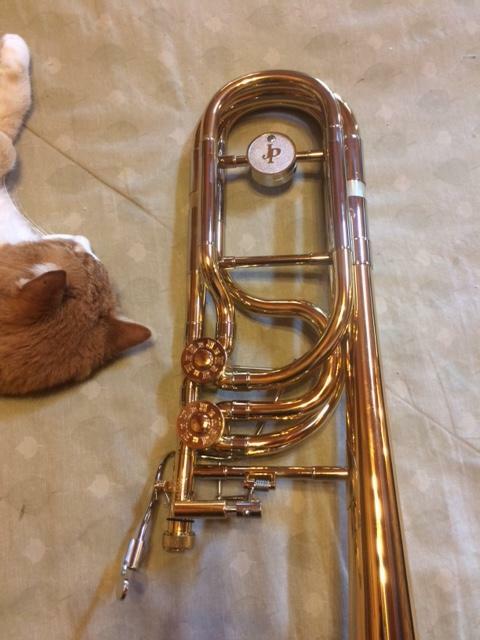 The "333 RATH" model, though, is a really serious bass trombone. The JP-RATH is ~really~ a nice instrument. One of my section mates uses the single-rotor version. He's not exactly an "anything will do" type of player; his tenor is an Edwards Alessi model. Last edited by bloke on Tue Sep 12, 2017 9:06 pm, edited 2 times in total. In two of the orchestras in which I play, the bass trombonists use Rath-designed instruments. John Rojak uses a Rath (dependent 2-rotor model) made in the UK, and Ed Morse uses a JP Rath (single rotor) model. Ed (just now) put this on youtube for me. It's from last week's first rehearsal. Obviously, I recorded it with my phone. funny: I'm playing New World again next month with John. bloke "I wish I could be as nice as either one of those guys..."
JP needs to get Max Bonecutter as an artiste. The Bonecutter Rath Bass Trombone....I would buy it just for the name alone. Casca Grossa wrote: JP needs to get Max Bonecutter as an artiste. 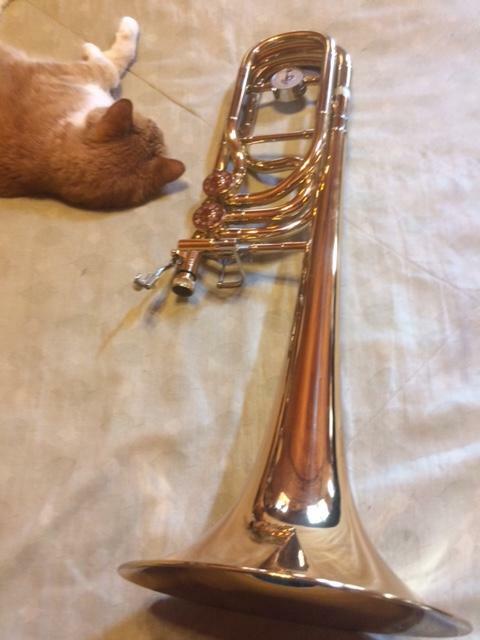 The Bonecutter Rath Bass Trombone....I would buy it just for the name alone. I dunno... He might even be a two-e's "artistee". Probably with an umlaut over at least one vowel too. ...so here's a hi-res pic. I don't think this is very easy to find on the web (yet). There are M.A.P. (Minimum Advertised Prices). Out of respect for dealer agreements, I do not publicly advertise my prices of JP products. tuning slides - close tolerances and superb alignment. The main slide can be operated with just one finger of one hand (no "coaxing" required at all). 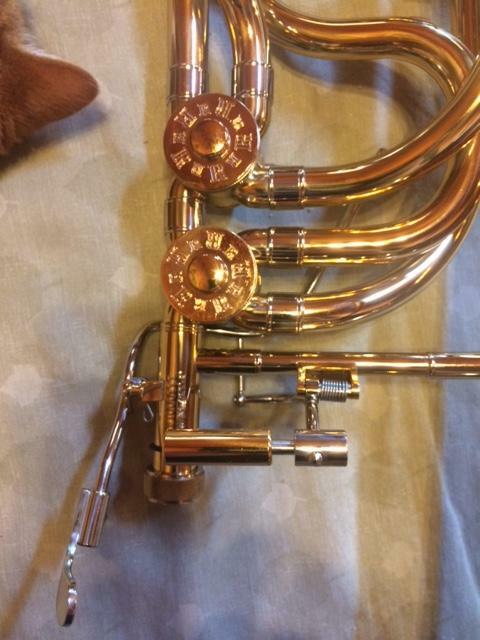 ...and yep, it appears to be (as are most of the top-line JP brass instruments) made of 80:20 alloy brass and nickel silver. With the bulky Megatone-like mouthpiece inserted and the two-screws counterweight removed, it weighs in at c. 6 lbs. oh and this: It sure is purdy ! ...so with what appears to be 80:20 alloy brass outside slide tubes and a nickel silver playing slide crook, I would rate the chance of any future playing slide red-rot at approximately 0%. Single or dual bore slide? Bob Kolada wrote: Single or dual bore slide? In the photo, the outer hand slide looks like it is nickel silver, same as the crook. Is that so? It's a production (not custom) instrument, such as a $4000 - $5000 Bach or Yamaha production model...but for thousands less, so the venturi/mouthpipe tube is fixed. The mouthpipe tube is nickel silver so (unlike brass ones, when they get old) it shouldn't ever rot. The outside slide tubes are made of the same type of brass (appears to be 80:20) as the rest of the instrument, and the playing slide crook is nickel silver. This bell section is so dang purdy, that I just had to take some (albeit hastily taken) pictures of it. Also featured is Mz. blokecat (Nikki, age 13...c. 68 in human years). I think a dual bore slide would be a nice option. I certainly could be, were their options. That having been said, the "blown out" instrument designs thing has been fading from vogue for a few years (in brass, woodwinds, and strings). It's a "production" instrument...with a model number...like a Bach or Yamaha with a model number and non-optional stuff. Michael Rath's UK-located factory offers options. Those trombones cost more, as do options. 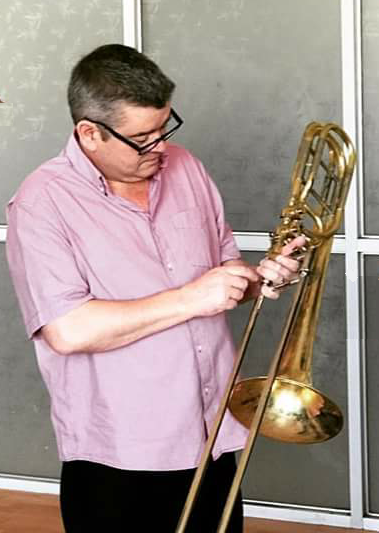 Actually, I think the UK-Rath factory offers a remarkably similar no-options bass trombone called the R-900...for $1XXX more than this JP333-RATH instrument.